Synthetic underlayment has a tough and durable construction with an extremely high tear strength compared to felt. *Test data is based on average of samples tested in accordance with ASTM D2261. When exposed to the elements, they don’t wrinkle and tear around fasteners like felt. *Varies by product. See installation instructions for more details. Endures up to 180 days of UV exposure & repels water. Synthetic underlayment is tough, durable material that resists small tears and stands up to boot traffic. Most synthetics are much lighter, so they are easier to handle and helps improve job site productivity. *9 (2 sq.) rolls of standard #30 felt compared to 2 (10 sq.) 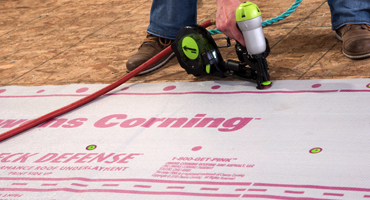 rolls of Owens Corning® Deck Defense® High-Performance Synthetic Underlayment. Individual product weights may vary. Fewer rolls, so less trips up the ladder. A typical 27 square home will require 3 rolls of synthetic underlayment compared to 14 rolls of #30 felt. Synthetic Underlayment comes in longer and wider rolls than felt. Synthetic underlayment come in 10 sq. rolls, 48” wide as compared to #30 felt 2 sq. rolls, 36” wide. Synthetic underlayment is engineered to provide a more secure walking surface. The enhanced slip-resistant surface creates better traction and allows crews to move easier, even on steep slopes. Synthetic underlayment has extremely high tear strength compared to felt. This means less tearing around fasteners during installation and fewer opportunities for water infiltration. Synthetic underlayment has well marked nailing and overlap guides to help improve installation accuracy and consistency. Synthetics have extremely high tear strength compared to felt. This means less tearing around fasteners during installation and fewer opportunities for water infiltration. Synthetics repel water while felt products absorb water. Most homeowners like the idea of having a product that sheds water serve as their secondary water protection barrier on their roof instead of a sponge. Synthetics are not a food source for mold like paper based #15 and #30 felt paper. *Samples tested in accordance with ASTM D3274. Roofing has evolved. Your underlayment should too. A new standard. A new level of confidence. 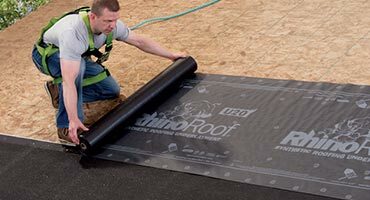 Tough, lightweight and weather-resistant, synthetic underlayment delivers advanced protection that’s easy on your crew, tough against the elements — and reassuring to your customers. Get the edge from the start. Insist on synthetic. 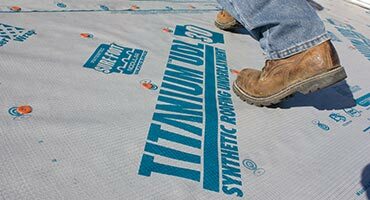 All Titanium UDL products have our patented Sure-Foot® slip-resistant nodular walking surface and backside slip resistant resin technology. Exceptional durability and strength allow the premium underlayments, if installed correctly, to be left exposed without suffering from blow-offs and tears. 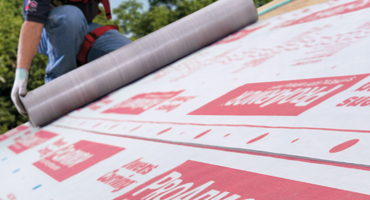 Deck Defense® High Performance Roof Underlayment features a durable, synthetic construction that works with your shingles to help shield your home from moisture infiltration. ProArmor is strong, durable and repels water unlike #15 felt. It’s also lighter, easier to install and contributes to safe working conditions for your crew. RhinoRoof U20 is a highly engineered, coated woven synthetic roofing underlayment. It combines a durable and high strength design with a fiber grip walking surface.